It has recently come to my attention that strong cryptography, while readily available (and free) is not straightforward to use for most people. Someone really ought to build some software which makes setting up and using strong encryption as easy to do as setting up a skype call, or twitter account. However, until someone gets around to doing that, we must make do with the tools we have. 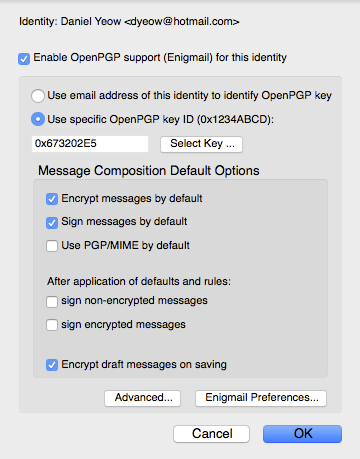 What follows is a step-by-step recipe for setting up PGP email encryption in the environment of the OSX operating system, commonly found on Apple computers. I will, as best as I am able, follow what are considered best practices. I will explicitly describe every step in painful detail so that even a novice should be able to follow the instructions and successfully communicate via encrypted email. click on it. (alternatively, you can press the “command” and “space” buttons at the same time to bring up the “spotlight search” in which you can type “safari” then press enter). Safari should open. In the address bar of the browser, cut and paste the following links (if you are viewing these instructions in a web browser, you can clik the links directly). They should cause your browser to automatically download some files. depending on how new your computer is, your list may not be as populated as mine. In any case, either at the top of the list or at the bottom, there should be the two files you recently downloaded. click on the “Install” icon, and follow the prompts. It should ask you for your password, and when it’s done go back to your “downloads” window. This installation process is relatively easy. 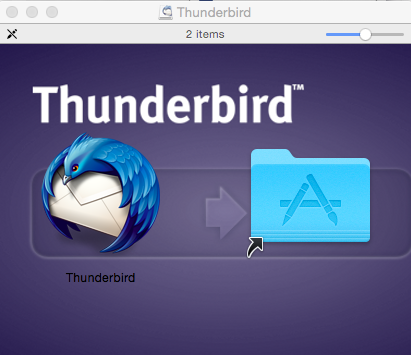 Simply drag the “Thunderbird” icon onto the one that looks like a masonic logo on a folder. This is where it begins to get complicated. 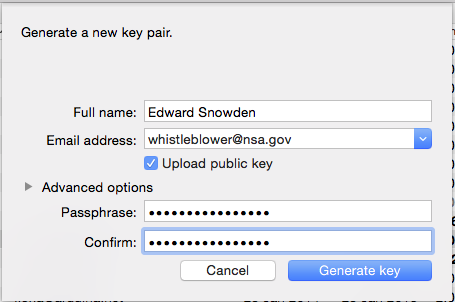 Now we are going to generate a pair of PGP keys. A central concept of public key cryptography is that you have two keys – one of them decrypts messages and one of them encrypts messages. Together they are called a “keypair”. The encryption key is the one you distribute to the public (via email, or through something called a “keyserver” which functions as a directory of keys) and this is called your “public key”. The other half of the keypair is called your “private key” and you must keep it safe, because that is the key that decrypts all the emails sent to you encrypted with your public key. 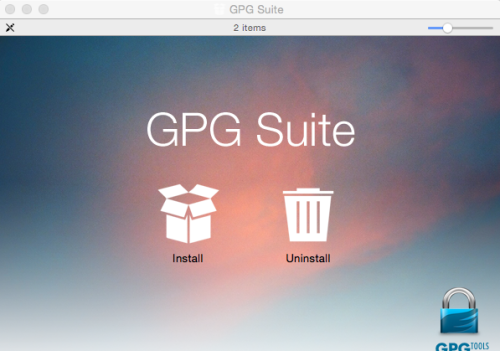 alternatively, pressing the “command” and “space” buttons on your keyboard at the same time, then typing “GPG Keychain” then pressing enter, should do the trick. Since this is your first key, don’t worry too much about anonymity. 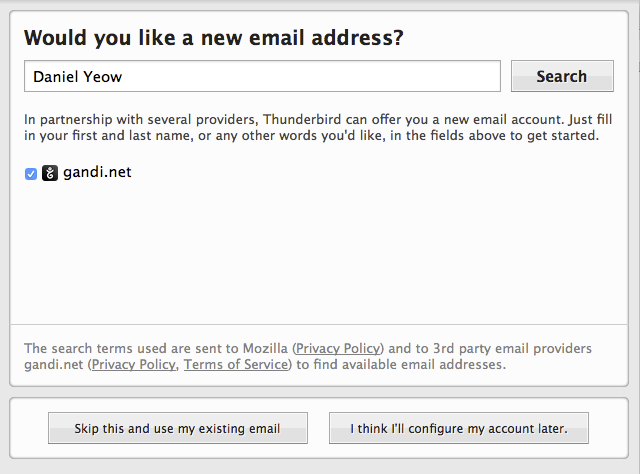 Fill in your full name, your email address, tick the “Upload public key” checkbox, and ignore the “advanced options” (the system defaults are very good, so we don’t need to worry ourselves with those options). The passphrase should be reasonably long, easy to remember, and contain numbers and special characters. Every time you use your private key, you will need this passphrase (although there is an option to store it in memory for a certain amount of time before it asks you again). Keep in mind that passphrase security is broken by computers that rapidly try different combinations of words, letters, numbers, and symbols, so an intentional misspelling or typo can also make things more difficult. now there should be a total of one key in your list of keys. In the first column it should say “sec/pub” which is short for “secret” and “public”. when you start collecting other people’s keys, you will tend to only have the “pub” key. for now, ignore all the other information listed beside your key. 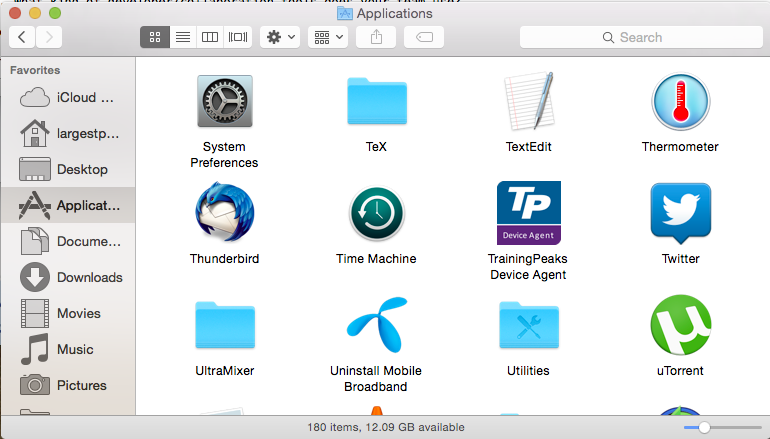 It will save a file with your private key to the desktop. Keep an eye on it. 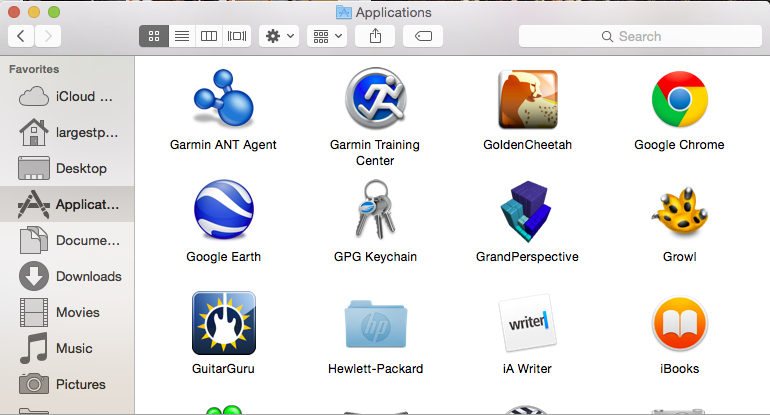 this will save a file containing a “revoke certificate” to the desktop. 13. What did you just do? You’ve done two important things. You’ve created a backup of your private key. If for any reason you lose the copy on your computer (like, if your computer gets stolen, for example), there is actually no way to decrypt any data encrypted with your public key without your private key. Keeping a backup safeguards against this. The revocation certificate is a slightly different thing. If your private key becomes unusable for some reason (maybe someone stole it and figured out your passphrase, or maybe you forgot your own passphrase) you can use the revoke certificate to tell the internet’s directory of public keys that your particular key is no longer in use. Once you’ve done this, nobody can use your public key (the one that is associated with the revoke certificate) to encrypt a message to you. Turning our attention back to our email program. 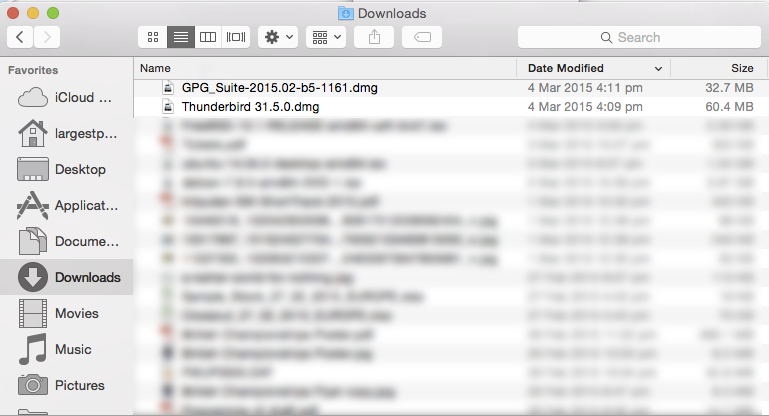 Locate “Thunderbird” either by visual search of your applications folder, or text search by pressing “space” and “command” at the same time, then typing “thunderbird”. The program is pretty smart, and can detect the settings of most common email providers such as hotmail, yahoo, gmail, etc. In this case, it collected the settings for my hotmail address. 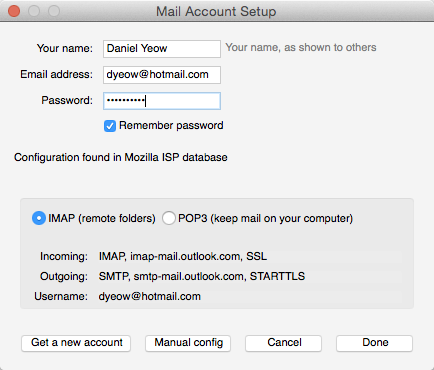 Select “IMAP” (in general, you should always select IMAP if possible) in the box below, then click “Done”. 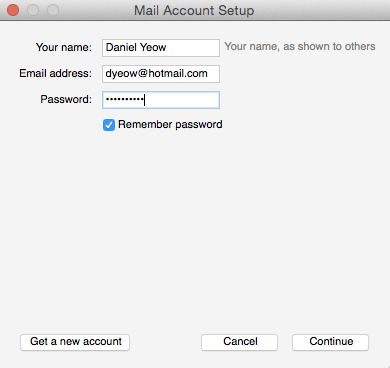 Congratulations, you have just set up an email program to use your webmail email! clicking “Retrieve key” will add my public key to your keychain, and you should now be able to send encryped emails to me. This is actually a little bit complicated. This is done through the use of a “fingerprint”. If you right click on my key and select “details” a little information pane comes up with lots of random facts about my key. Somewhere in there is a 40-character fingerprint which you can use to verify the key to make sure that it wasn’t intercepted and changed in transit. This can be done over the phone, or in person, or through carrier pigeon. The important point is that it is verified by a means other than email which is either very public, or “real time”. You can verify the fingerprint of my key by going to the “contact” page of my website – it’s near the bottom. 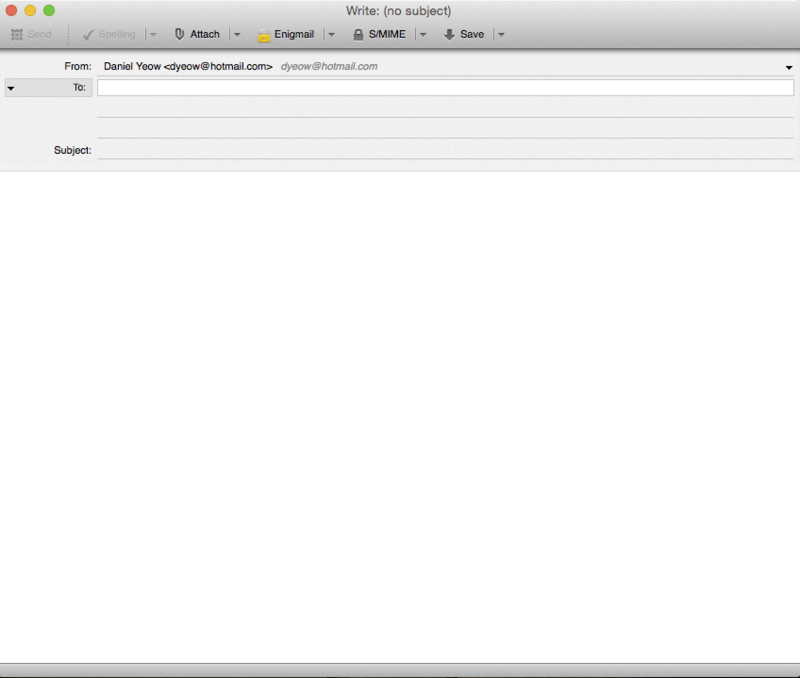 A little box should pop up asking you to configure Enigmail. Do it. When configuring enigmail, follow what I’ve done in the box below. When you click on “Use specific OpenPGP key ID” click on Select Key, and select your own key (not mine, although you shouldn’t be able to select it, since you only have my public key and not a full keypair). Now we’re finally ready to send an encrypted email. Fill out all your fields. If the email in the “To:” field matches a public key in your keychain, the program should automatically encrypt any mail sent to them. 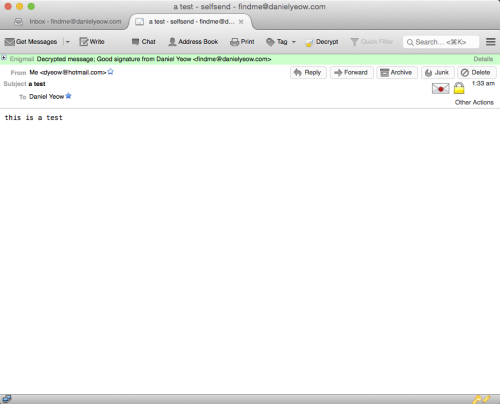 Important note: the subject field is NOT encrypted, so don’t write anything important there! You may have noticed two new icons at the top of the compose window. One of them looks like a key, and the other one looks like a pencil. Clicking on the key toggles encryption on and off. Clicking on the pencil toggles “signing” on and off. A cryptographic signature is a small chunk of code which is encrypted using your private key. This seems silly because, since everyone has your public key, something encrypted with your private key can be decrypted by anyone with access to your public key, which is everyone. However, because only you have your private key, it is a clever way of making sure that the message actually did come from you – or at least your key. 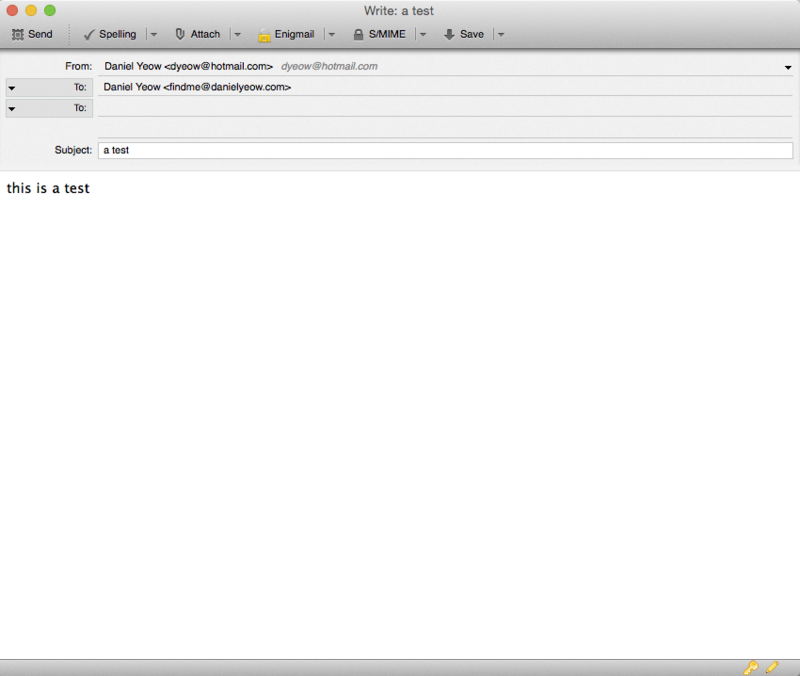 Check that encryption and signing are toggled “on” and click send. Everything should work. Note: if the message is the first that you’ve sent to that particular recipient, then you should also click “attach my public key” so that they have a copy of your encryption key with which to send you encrypted emails. with any luck, I should be able to find your public key on a keyserver (they talk to each other and update each other) and send you an encrypted reply. otherwise, it used to be fairly normal practice to attach your public key to messages that you sent so that they could send encrypted mail back to you. If anyone out there thinks that this whole process in unnecessarily complicated; I couldn’t agree more. 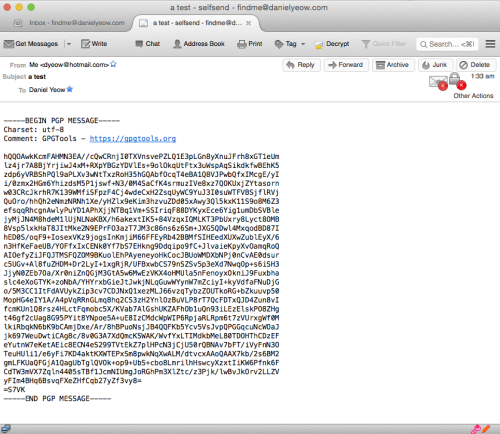 I’ve been messing around with PGP for a long time (it’s been around since 1991!) and it has progressed in leaps and bounds in terms of ease of installation and use, but it’s still not ready for the mainstream. Hopefully this guide can help non tech-savvy people communicate securely. Good luck, and I hope to hear from you soon!